Our programme is uniquely positioned to develop future leaders, entrepreneurs, academics, owners and managers. 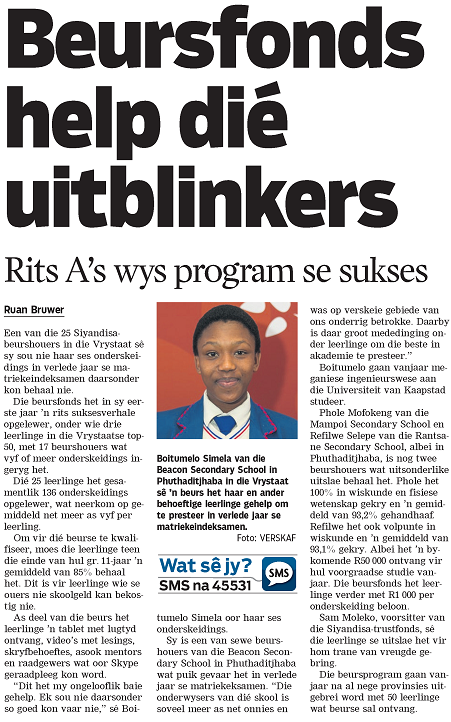 It is an encompassing skills development programme aimed at developing highly qualified black males and females. 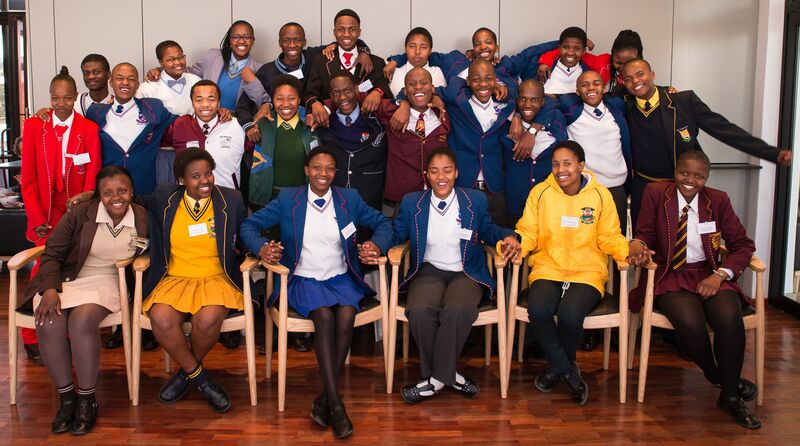 We annually identify top black male and female Grade 12 learners across South Africa and invest in growing excellence with technology, training, mentorship, counselling, internships, bursaries to create study and employment opportunities. 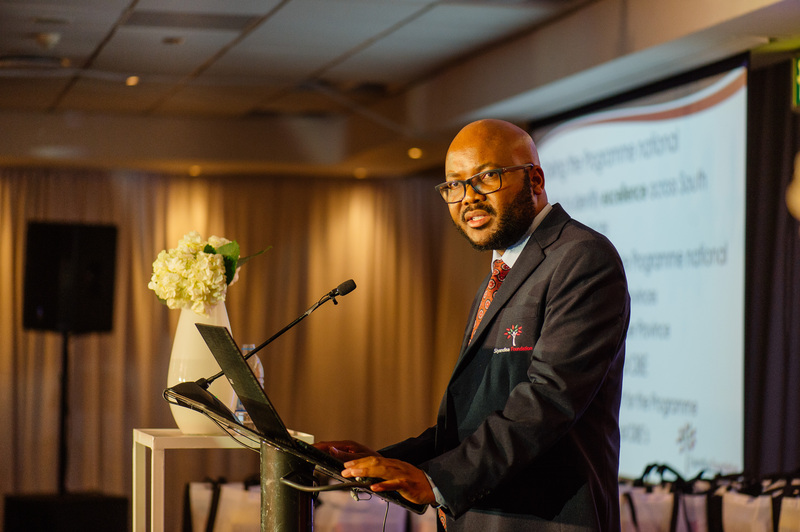 Our scholarship offering is encompassing with recipients receiving extensive programme support, technology and communication tools, bespoke Grade 12 learning content, online training, counselling support, mentorship, career guidance, awards and bursaries, internship and employment opportunities and an extensive alumni programme. Each scholarship recipient becomes a member of a select group of alumni. Our programme establishes a long-term relationship with each recipient and assists them to not only enrol at a tertiary education institution, but also support them with counselling, internship opportunities and post-graduate bursary options to achieve excellence at a tertiary level. The programme is supported by partners which support, fund, sponsor, mentor and provide opportunities for our recipients. Partners get involved as general sponsors or donors or more personally through mentorship, internships and targeted bursaries. Our programme also closely partners with national and provincial departments of basic education to identify our bursary recipients. 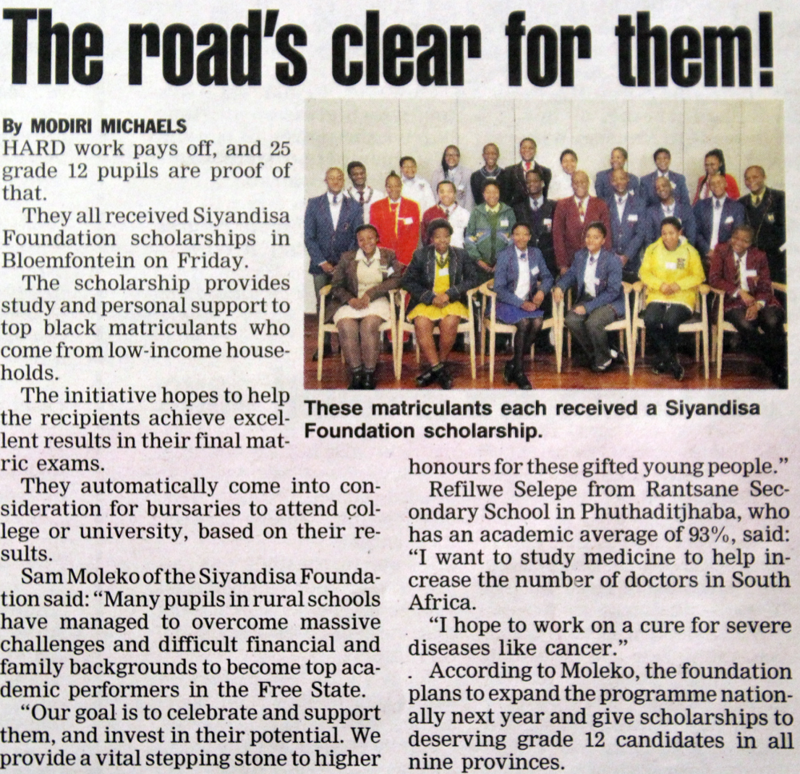 Scholarships provided to 25 gifted Free State matriculants by the Siyandisa Foundation to cement a promising future for them. 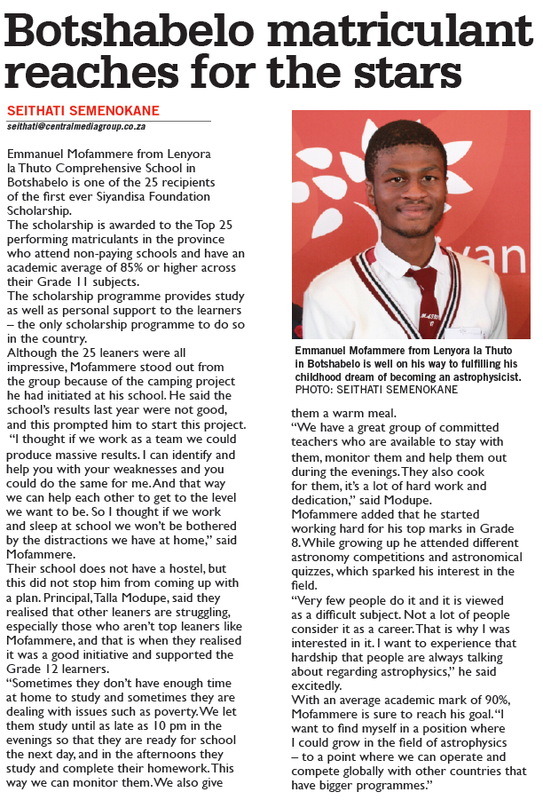 Scholarship recipient Emmanuel Mofammere wants to study Astrophysics, and with a 90% average, is sure to achieve this dream! 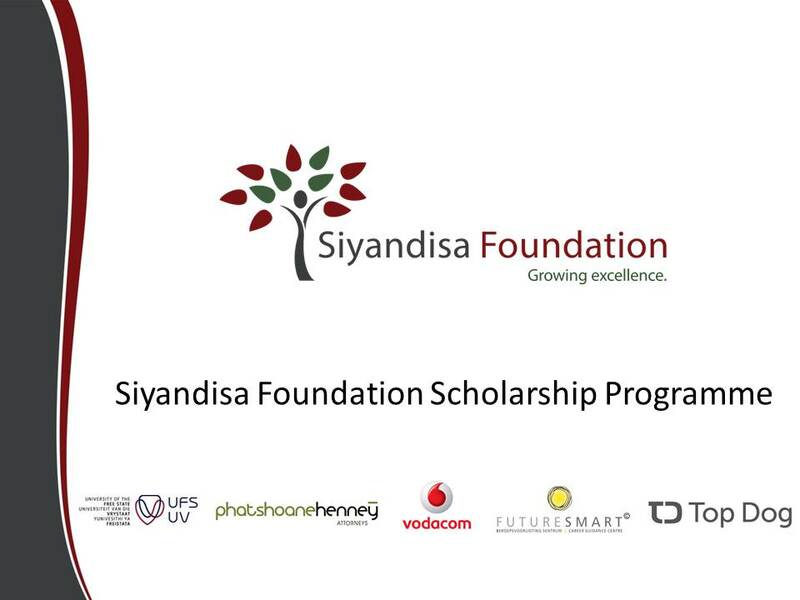 The Siyandisa Foundation Scholarship Programme aims to invest in the leaders and success stories of tomorrow. 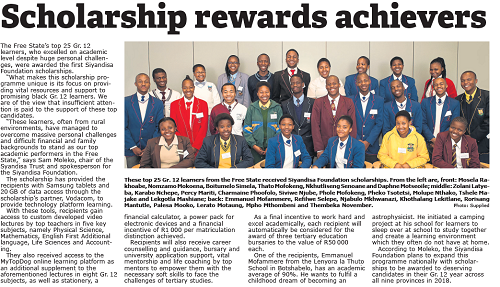 Following the handover of the Siyandisa Foundation Scholarships in Bloemfontein, Courant newspaper proclaimed the study as well as personal support the bursaries provide the learners with, as unique compared to any other scholarship programme in South Africa. 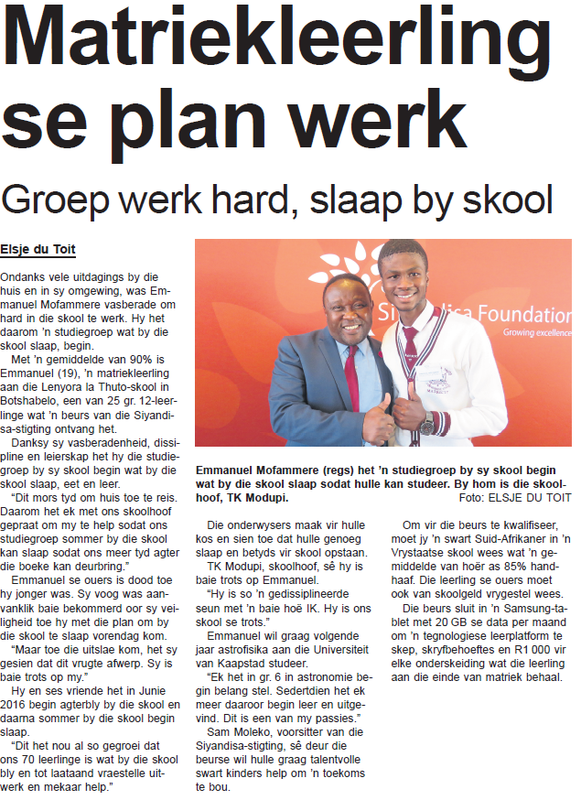 Emmanuel Mofammere, a recipient of a Siyandisa Foundation Scholarship, has shared the story of his remarkable plan to help elevate the marks of his fellow pupils at the Lenyora la Thuto school in Botshabelo, with Volksblad's Elsje du Toit. 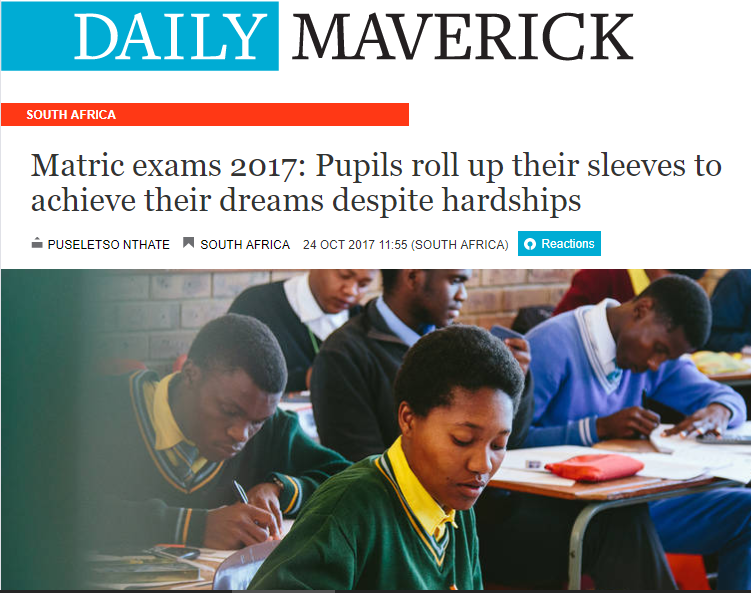 Daily Maverick has published a touching behind-the-scenes portrayal of the hardships some of this year's Siyandisa Foundation Scholarship recipients have had to overcome to excel academically and dream as big as they do. 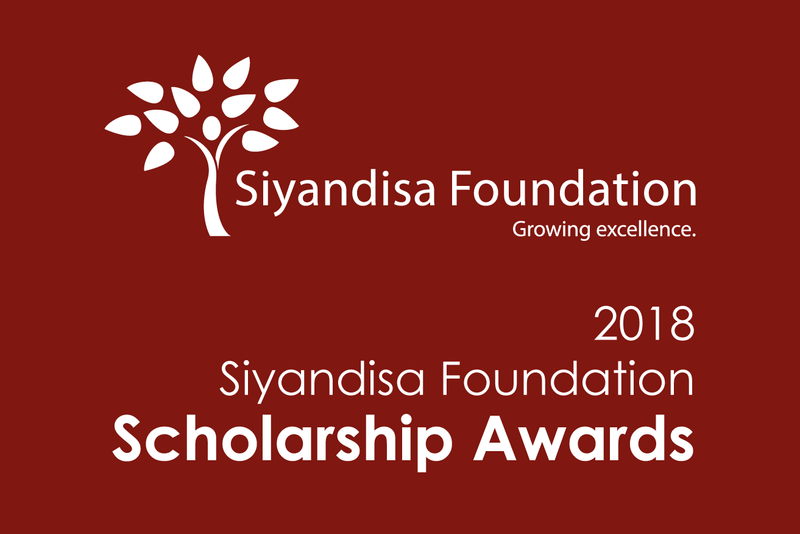 Following the first successful Siyandisa Foundation Scholarships awarded to 25 deserving Free State learners this year, the Siyandisa Foundation Scholarship Programme is set to expand nationally in 2018 and award scholarships to the top learners from all nine provinces. 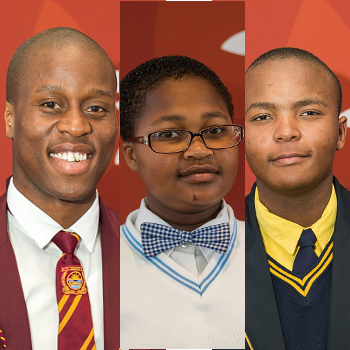 Three of the first 25 Siyandisa Foundation Scholarship Recipients were ranked among the top 10 matriculants in the Free State following the 2017 Matric Results, with an additional 14 recipients placed among the Free State Province Top 100 Matriculants. 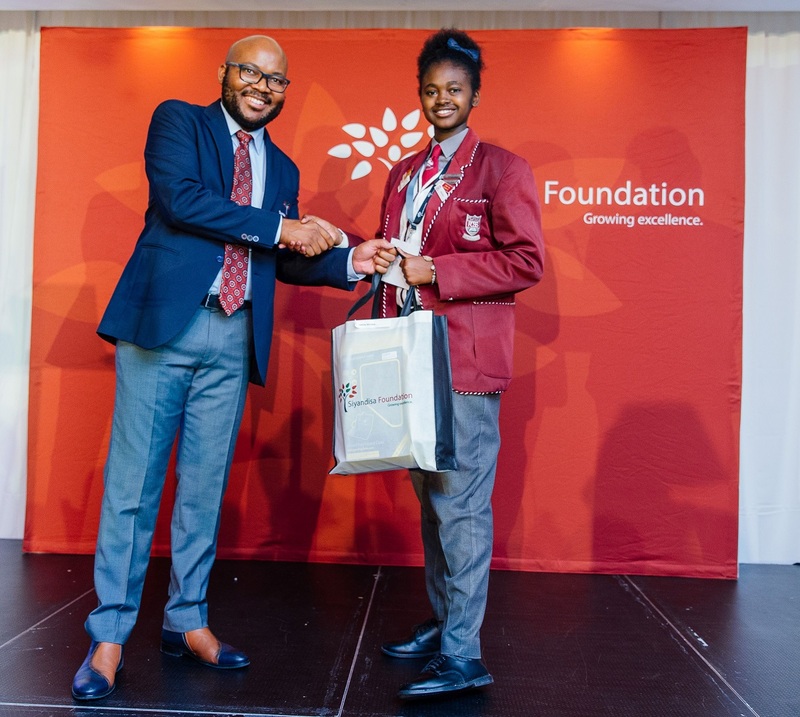 Following the release of the 2017 Matric Results, the Siyandisa Foundation paid R50, 000 to each of the three top performing Siyandisa Foundation Scholarship Recipients, with a further R136, 000 in total paid out to the 25 recipients for their 136 distinctions achieved. 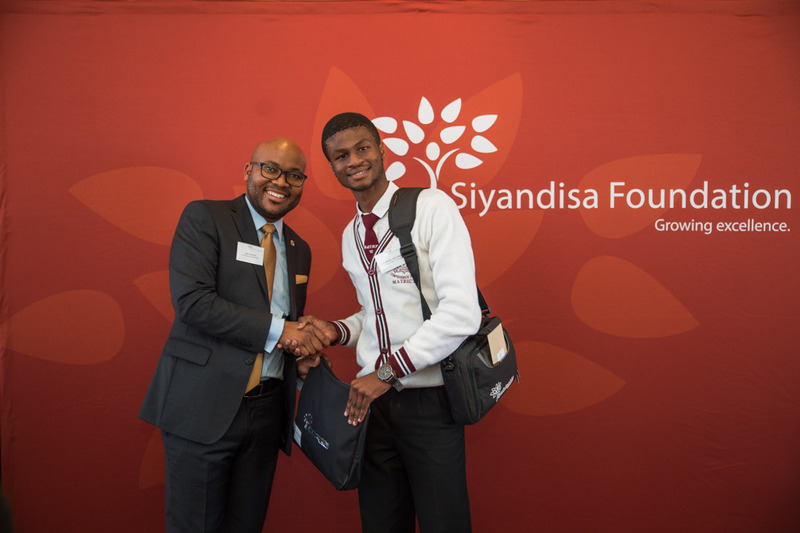 A partner to the Siyandisa Foundation has generously donated a total of R120 000 to four of the 2017 Siyandisa Scholarship recipients currently enrolled to study engineering. 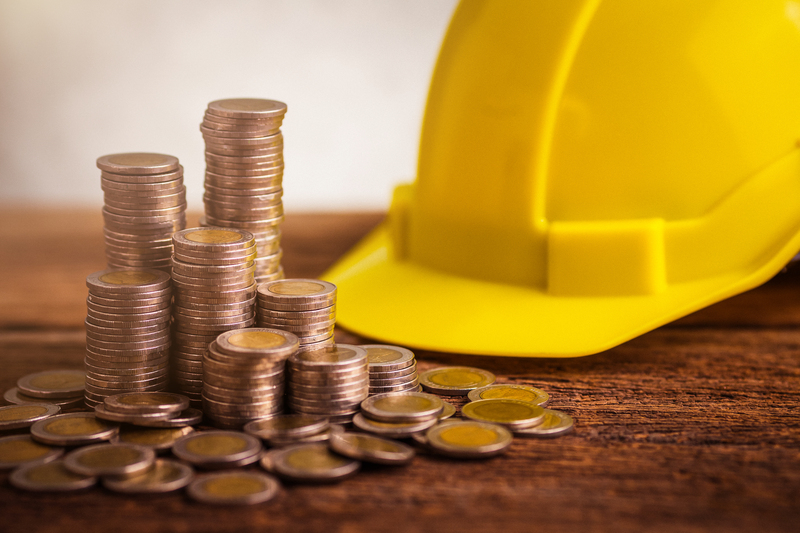 A partner to the Siyandisa Foundation who had earlier this year donated a total of R120 000 to four 2017 Siyandisa Scholarship recipients studying engineering, has generously increased this donation to R200 000 in total. 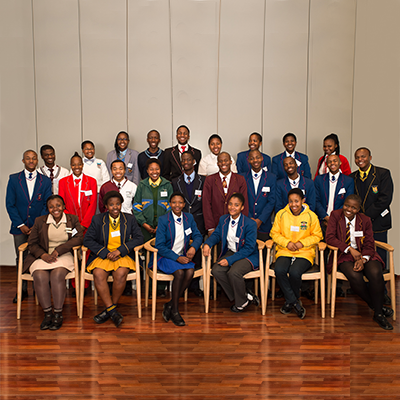 Now in its second year, a total of 50 top black grade 12 learners from all across South Africa will receive the highest honours when they are awarded Siyandisa Foundation Scholarships on the 25th of May 2018. 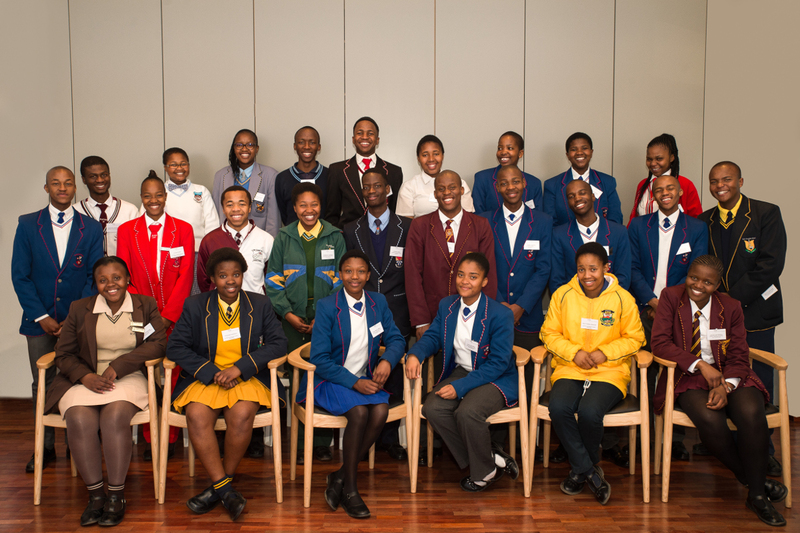 On Friday 25 May the Siyandisa Foundation awarded 50 top black matriculants across South Africa with its unique scholarships aimed at empowering them to achieve the best possible results in their final matriculation exams and further tertiary studies. 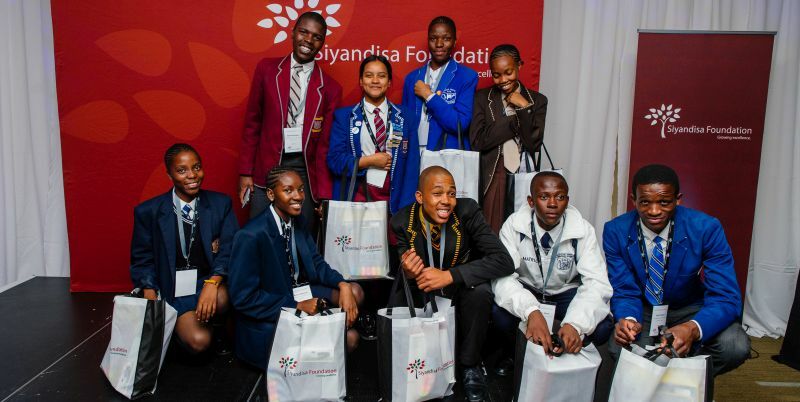 Watch how 50 top black matriculants from all over South Africa each receive a Siyandisa Foundation Scholarship aimed at empowering them to achieve the best possible results in their final matriculation exams and further tertiary studies. See how lives change! In light of the success and continued expansion of the Siyandisa Foundation Scholarships, Planet Fitness has officially come on board as ‘fitness partner’ to the programme. 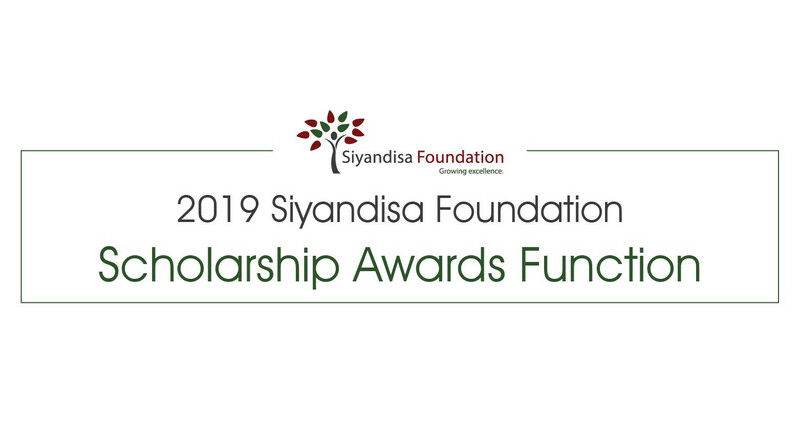 The 50 Siyandisa Foundation Scholarship Recipients of 2018 achieved an impressive 276 distinctions in total in the 2018 matric exams, resulting in an average of more than five distinctions per learner. 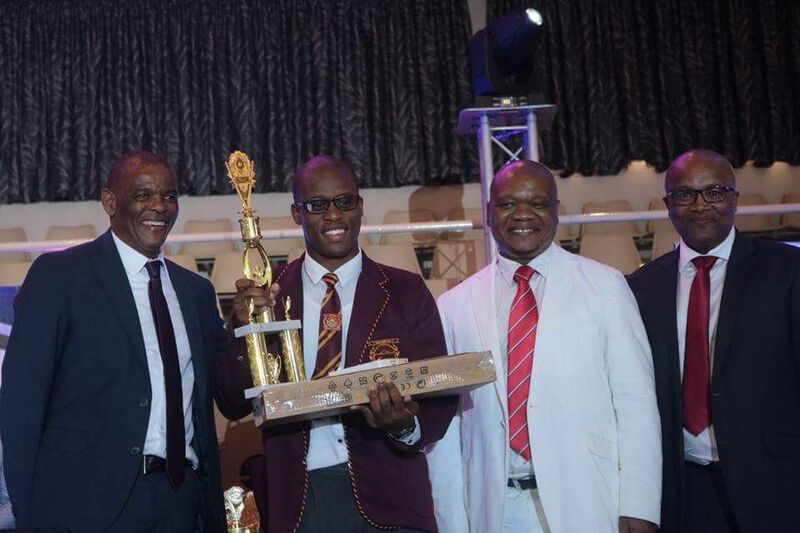 Lwazi Thobani from Ncedisizwe Secondary School in the Eastern Cape, who achieved six distinctions in the 2018 matric exams, has lauded Siyandisa Foundation for changing his life through the scholarship awarded to him. 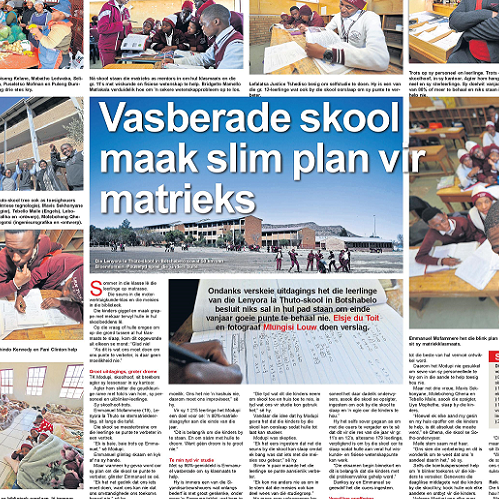 Innocent Mashula from Mulenga Secondary School in Vhembe, Limpopo has risen above very difficult circumstances to achieve seven distinction and an average of 92,71% in his final matric exams. 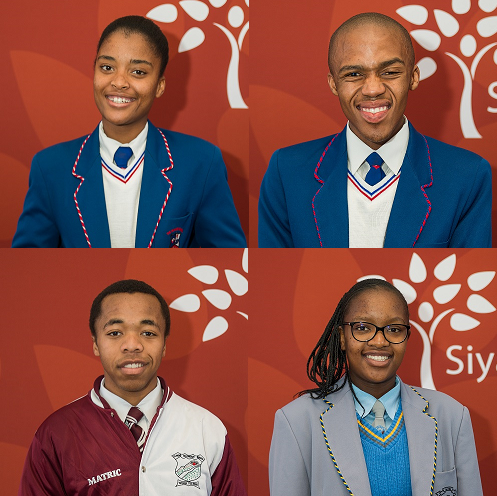 To award their outstanding achievements in the 2018 matriculation exams, the five top performing 2018 Siyandisa Foundation Scholarship Recipients were awarded merit bursaries of R50 000 each. 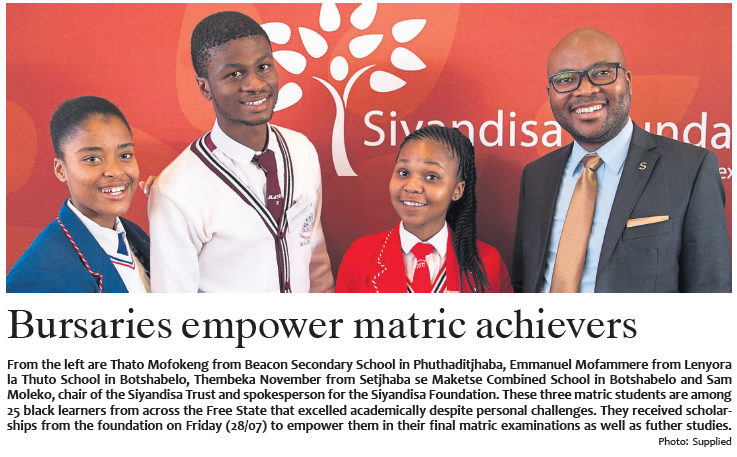 This marks the third successive year that the Siyandisa Foundation awarded its unique scholarships to black matriculants from low income households who are among the country’s top academic performers despite facing enormous personal and financial challenges on a daily basis. 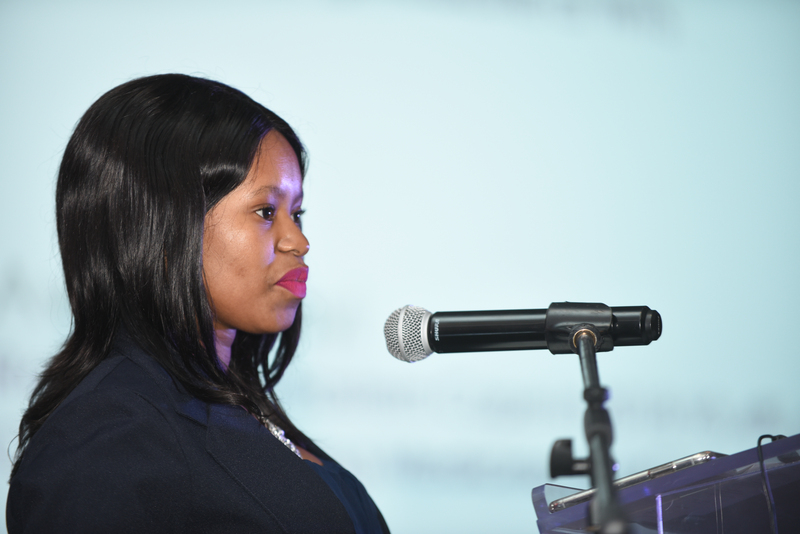 "How the 2018 Siyandisa Foundation Scholarship changed my life"
The top recipient of the 2018 Siyandisa Foundation Scholarships captivated the audience at the 2019 Siyandisa Foundation Scholarships Awards function, when she recounted the impact the scholarship had on her life. You can contact Cikizwa Bacela at the contact details provided below or send us an email through our email form.